Apologies to anyone who has read bits of this on other threads and posts. I just decided it would be better (for my future reference) if i put it all together on a single Kham thread. I only set the tank up around 3 weeks ago, with a mere 3 day deadline before Kham arrived by courier. So i did what I could. Day 1 was just substrate and temporarily dumped in plants. Then the log arrived and I went for a central island peak shape, with log as a cave. The plants all came from a single shop. A nice shop. None of them have started melting, dying back, or suffering, which is a major achievement. Will definitely use them again. The diatom bloom started within the first week. Leopard spots on the java ferns that fell off within 3 days, followed by thick brown coating on the upward facing leaves. Then i added a dwarf lotus ‘aurora’ which came with snails. Everything was going OK, except for Kham glass surfing more than I liked. So i moved a couple of plants and his surfing halved. Which i took to be a huge clue to move plants up against the sides, to break his view and swimming lines. Also, since i really don’t want a pond snail infestation, I went out today after work and bought a single Assassin Snail (and a few more plants). Quite a different look (and I don’t like it as much). Too ‘busy’ and crowded with plants for my human aesthetic, but Kham loves it. Oh, and the Assassin is on patrol. Can you spot him? I’m now over three weeks in, the tank has cycled (more of that later), and I’m beginning to consider the other future inhabitants. saracatlin and BetterGetABetta like this. It was always going to be a Fish In cycle this time. So I chose a Fluval Flex 57 litre because it would let me customise the filtration a lot. The back two inches of the tank are sectioned off by a black glass wall. Behind the wall are 3 chambers. The first is usually empty. The second contains foam and filter media, the third has the pump and the thermometer. Masses of filtration as standard. I wanted more, to speed up the cycle. The filter outlet (there are 2 spouts) spits out very forcefully, and (didn’t realise this til I turned it on) is NOT adjustable, and was basically FAR too much. I have seen people cutting holes in the outlet pipe, but that is both drastic and non reversible. There is still plenty of flow, but it isn’t too strong for Kham and plants. Or irritatingly noisy. The substrate is Tropica ‘soil’. Very pleased with that, too. Although it contrasts with every pale poo, unburied root, fragment of food and 2 lumps of that plant wool stuff that I need to fish out! I think the cycling took less than 2 weeks, but I couldn’t quite believe it, and kept dosing with 2 drops Prime/g for several days longer than I needed to. The light is clearly bright enough to grow algae, so I hope it is bright enough for the plants! You Done good, real good. The tank is beautiful. I know your Kham will love the exploration. Cannot wait to see progress! Why not make this a journal and link in your signature? he is magnificent. A real stunner! I will def link to my sig. that is a great idea. Kham is a very happy chap. He started off unable to eat from the surface. Which was a bit odd. I had to give him fine grained food and release it below the surface so he could ‘hunt’ it as it sank. This led to some overfeeding, which has probably encouraged the snails, but also probably helped the filter. He will now happily snap small stuff from the surface, but anything as big as New Life pellets just gets pecked at and left. 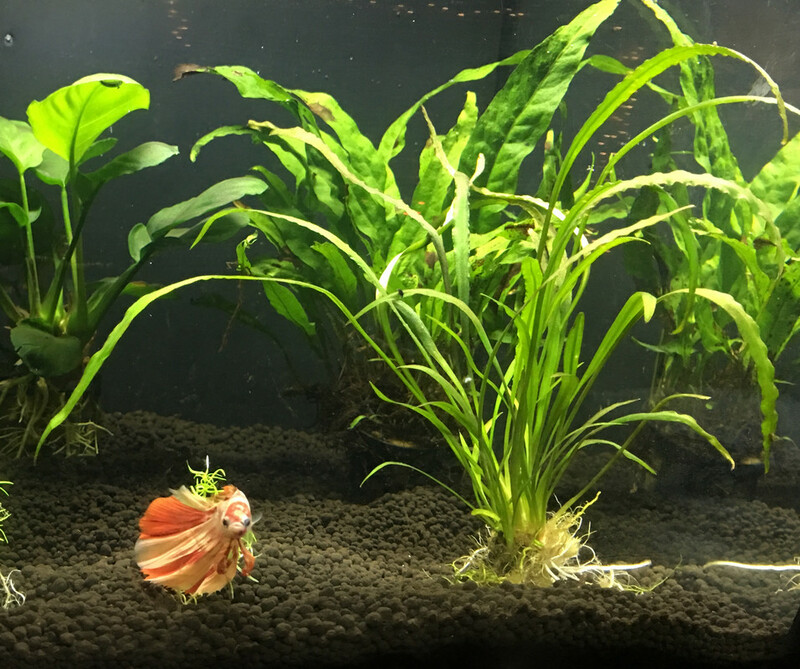 He dances around glass surfing (a lot less than before, now I have rearranged the planting). The log was scary to start with. Now he loves it. The cattapa leaf was scary. Now he ignores it. The Assassin was interesting! But then it disappeared into a hidden stealth hunt. 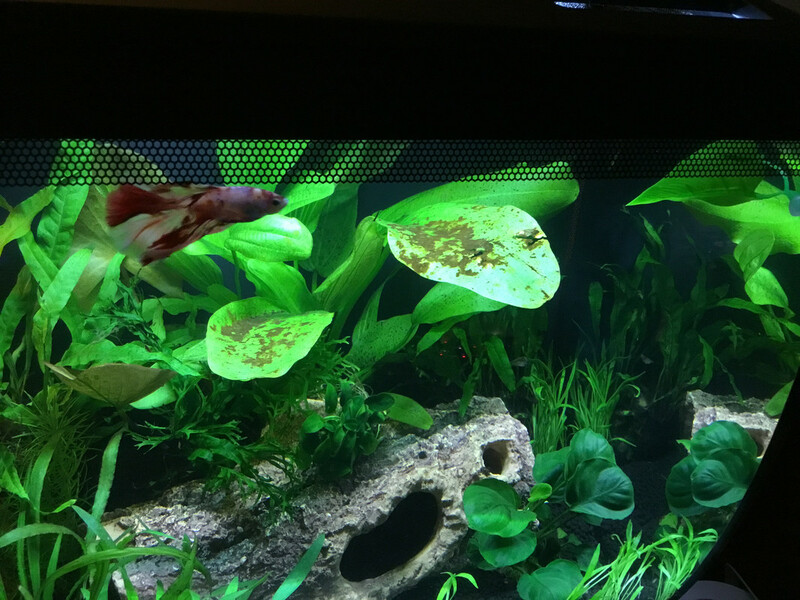 He loves the floating log, the current, the stick on Betta leaf, and for some reason he has knocked the pH Alert if twice because it offends him. Red colour? He ignores the Ammonia Alert (blue and yellow) completely. But he loves the plants most. Wriggling and squirming through them. Resting in, on and under. Manoevreing his way through. I expect I may have to thin them out as they grow, esp the dwarf lotus. I had a similar flow issue with the Spec III and V. Instead of drilling holes in the pipe I got some air hose put holes in that and connected it to the spray bar. I run it 1/2 to 2/3 the distance of the tank. RussellTheShihTzu and bluesamphire like this. 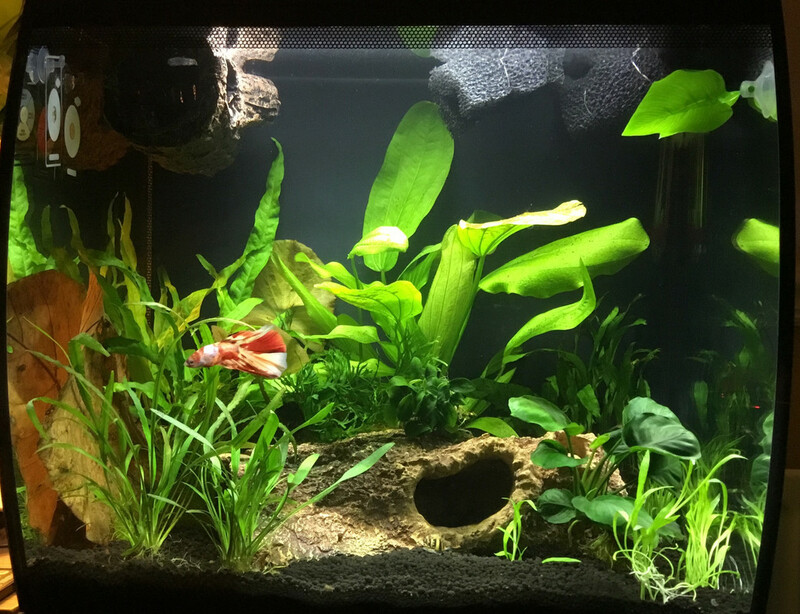 One axiom I firmly believe: If you can see your Betta at a glance you do not have enough plants. 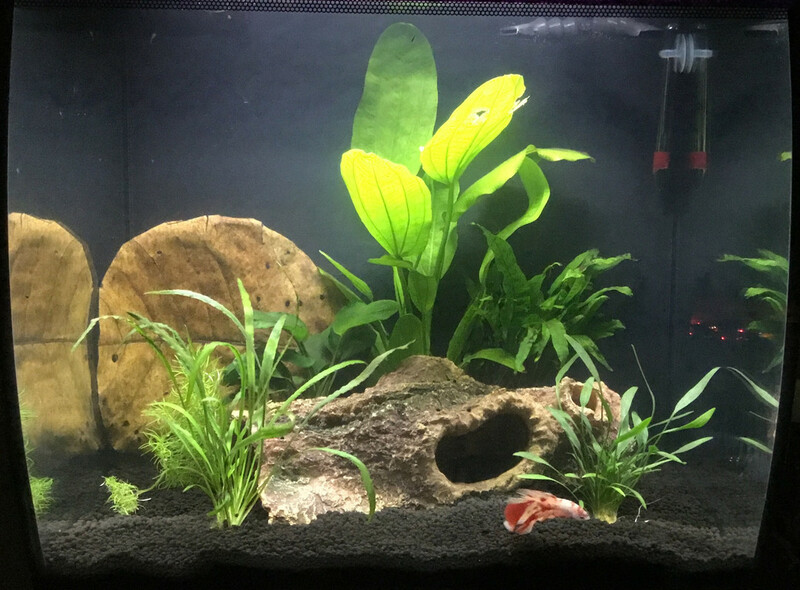 Second take aquascape is more Betta friendly. Would you like me to move this to Journals? If you wish, I can change the title, too.